What exactly is Metal Clay? 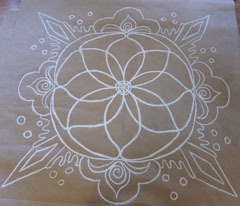 Learn about the East Indian Festival of Diwali and find out about making a giant piece of communal floor art called a "Rangoli" to help celebrate. Ok, so this isn’t metal clay related, but I was asked to make it and I was really happy with how it turned out, so I wanted to post it :) This was made for the Unitarian Society of Germantown in Philadelphia for their annual Diwali celebration. 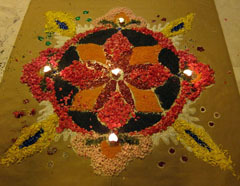 Diwali is an East Indian tradition to celebrate light in the darkness of winter. 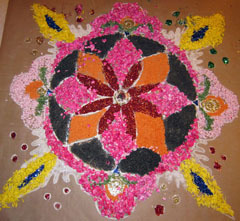 Usually the woman of the house makes this Rangoli using chalk in front of the house and then fills the lines with flower petals, colored chalk dust, beans, lentils, colored sand, anything with bright colors. It is meant to be temporary and only last for that day. The festival lasts for many days, sometime in early November, and she must make a new one every day. I made the outline, but I had everyone in the sanctuary come up and help fill each section until it was completed. It was truly a group effort. It was a great celebration. After, we shut off all the lights and lit hundreds of little candles. It was really beautiful!